In U.S.-China Trade Talks, Beijing's Favoring Chinese Firms Is Sticking Point China's government plays a large, powerful role in how its businesses operate — giving them preferential treatment over their rivals. That's a big sticking point in U.S.-China trade talks. 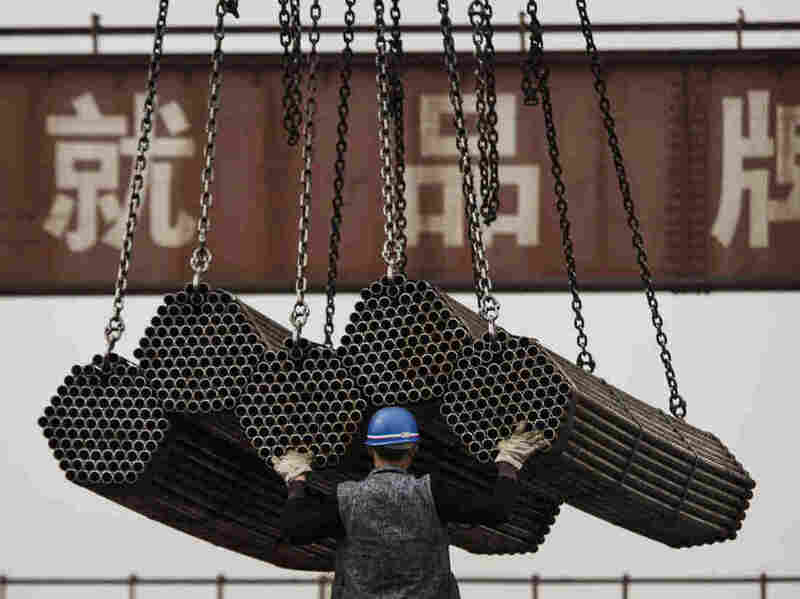 A worker helps load steel rods April 6, 2016, at a plant in Tangshan, in China's Hebei province. China's government plays a powerful role in how its businesses operate — giving them preferential treatment over their rivals. In the 1980s, China was beginning a long economic boom that would transform the global trading system, and Michael Korchmar decided to go there to launch a joint venture. He quickly soured on the country. "It didn't feel right," recalls Korchmar, whose family runs a 102-year-old Florida-based company that makes briefcases and travel bags. The Chinese government maintained a heavy hand in his staffing and factory decisions, and its minders followed him everywhere. So Korchmar cut his ties to China and eventually opened a plant in the Dominican Republic. But he could never quite escape China's orbit. Over the years, companies in his field have faced bruising competition from Chinese firms that could undercut his prices because they were heavily subsidized by the government, he says. "The government runs the economy," he concluded. "To think the government's not involved in any business practice in China is really I think a bit naïve." Today, the United States and China are locked in intense negotiations aimed at resolving their trade differences. But there's an elephant in the room: Far more than other major economies, China's government plays a large, powerful role in how its businesses operate, giving them preferential treatment over their rivals. Critics say this gives Chinese companies an unfair advantage over outsiders and makes it hard for foreign firms to really compete in China. "The China that we trade with and compete with today is very different from the one that we had hoped would emerge," says Democratic Rep. Richard Neal of Massachusetts, who chairs the powerful House Ways and Means Committee. "China's economy, which has taken on some market characteristics, remains fundamentally state-directed." Consider this: China has more companies in the Fortune 500 than any country except the United States. More than half of those firms are controlled by a single government agency, the state-owned Assets Supervision and Administration Commission, wrote Harvard law professor Mark Wu, in a 2016 article, "The 'China, Inc.' Challenge To Global trade Governance." Many of these companies are in essential sectors such as railroads, energy, shipbuilding and telecommunications. But government officials also maintain strong ties to private companies, says Jennifer Hillman, a professor at Georgetown University Law Center. "They're able to direct resources and push resources into those industries and those entities they are trying to favor," Hillman says. She notes that at least one member of the Communist Party sits on the board of virtually every company of any size, and they exert considerable power over corporate decisions. The Chinese government's influence extends to the financial world as well. The largest shareholder of China's "Big Four" commercial banks is Central Huijin Investment Ltd., which is managed by the China Investment Corp. The government can order Central Huijin to direct funds and make loans for favored projects. "The closest analogue would be if, in the aftermath of the 2008 financial crisis, the U.S. Treasury Department set up a single government entity to act as the controlling shareholder of JPMorgan Chase, Bank of America, Citibank and Wells Fargo," Wu wrote. Even when a company has no explicit ties to the government or the party, executives must work hard to stay in Beijing's good graces, if they want their companies to have access to the best contracts, Wu says. "People understand what the objectives are and they'll operate within those confines," he says. "A lot of private companies in China, even publicly listed companies, take a lot of direction from the government, or are picked by the government as state champions," says Patrick Chovanec, chief strategist at Silvercrest Asset Management, who taught in China for years. None of this is unprecedented, Wu notes. Governments own or control major companies in other places, and there's a revolving door between business and government all over the world, including the United States. But few states exert the kind of strong control over their economies that China does, Wu says. And those ties have only gotten stronger under President Xi Jinping. When China joined the World Trade Organization in 2001, it essentially promised to open up its economy and adopt free-market principles. Reformers inside China argued that the country's economy needed to look more like that of the United States. Events of the past decade have undermined the reformers and given Beijing more confidence in its hybrid system, Chovanec says. "In the wake of the 2008 financial crisis, China took a different look at what its economic model should look like. And a model that was more state-driven looked a lot more attractive to them," Chovanec says. Successive U.S. administrations have argued that these policies violate the spirit — if not the letter — of WTO regulations. One of the aims of the current trade negotiations is to get Beijing to stop corporate subsidies. But the opaque nature of China's economy makes it hard for outsiders to understand the true nature of the relationship between companies and the government, Chovanec says. In a country such as France, a telecommunications or energy company may be part of the state sector, eligible for special subsidies or tax credits, but the ties are supposed to be on the record, he says. "Whereas in China, a lot of this is behind the scenes and it's very nebulous," Chovanec says. Chinese government officials are adept at giving preferential treatment to their own companies without leaving their fingerprints anywhere, he says. They also know how to make life tough for foreign businesses. "They will just say, 'Well, there's a slowdown in inspections of this type of product from your country. It's for safety.' It makes it hard for you to then turn around and say, 'OK, you're engaging in illegal activity.' Because there's complete deniability," Chovanec says. As Trump administration officials seek to overhaul China's trade policies, they need to be realistic. Chinese officials believe their system has served them well, and they're not going to change it overnight, Wu says. "To the extent that we're expecting major, fundamental structural reforms, that's going to be very difficult to obtain, because they see this governance structure as being having been vital for both their political and economic successes," he says.